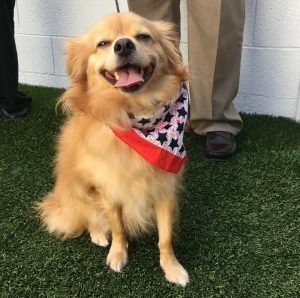 Have No Fear, 4th of July Pet Tips are Here! • Dogs and cats should be microchipped and wear current I.D. tags at all times. Make sure your contact info is up-to-date with the microchip company. This is the best way to ensure a happy reunion if your pet goes missing. • Leave the family pet at home, where he will be safe, secure, and less stressed. Loud noises from fireworks can cause a dog to jump a fence and run away or a cat to hide for days. Keeping your pets indoors and secure will also keep them from dangerous roadways. • Training your dog to “Come When Called” can be life-saving. spcaLA offers a variety of obedience training classes. • If you’re hosting a party, keep your pet in a cool, well-ventilated room with a radio playing softly in the background. Include your pet’s favorite toys, a tasty chew, and a pet bed or blanket for comfort. Do this as well if you are going out and your pet is staying home. • Keep alcoholic beverages, lighter fluids, matches, and insect repellents (like citronella candles) away from your pets. These items can be toxic or deadly when ingested or inhaled. Some foods are toxic for dogs like chocolate, onions, tomatoes, avocados and grapes. Watch out for cooked bones. When chewed and ingested, they can splinter and be fatal. • Do not tether your dog outside to keep him from escaping. The loud noises from fireworks can frighten your pooch making him more likely to attempt to flee. Dogs can seriously injure themselves in the tether, or even die, trying to escape. • Teach children not to tease or harm pets with firecrackers or sparklers. • If your pet requires sun protection, only use sunscreens intended for animals. • By law you MUST report found pets to local animal care services. Please do this as it will be the first place people look for lost pets.